Most Candles are as Toxic as Cigarettes. The Candles You Should Use! There is something about the soothing scent and glow from a flickering candle to warm the room. As an adult, one of my favorite Christmas gifts was a gift card to a popular candle store. Until I learned that not only was I filling my home with an artificial (although pleasant) fragrance, toxin were included in the fumes. 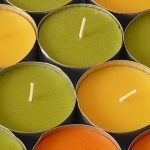 Many candles are made with paraffin or paraffin blend. This petroleum derivative is an inexpensive wax which is why it is often utilized by manufacturers. People with asthma can have increased respiratory difficulty around burning paraffin candles and can be as dangerous as second hand smoke. See why the EZ Breathe Ventilation System is a great solution for clean breathable air. When melted, paraffin releases fumes that are similar to those of a diesel engine, filling the air with carcinogenic chemicals. Benzene and toluene are known carcinogens that are released into the air from melted paraffin causing headaches to lung cancer. The National Institute for Occupational Safety and Health recommended limited exposure to paraffin wax fumes. Paraffin fumes have been found to cause tumors in the kidneys and liver of lab animals.